I’ve been extremely lucky in scoring a beta test key for Cataclysm – this will be my third beta (I never played the original WoW beta) and I have to say that I really, really enjoy betas. There are some parts of them that are more fun than the live game, in fact. So, I spent half the weekend downloading the Cataclysm client and its many, many, many patches (and exceeded my internet quota to boot!) and I’ve been poking around and I’m pretty impressed. This beta feels very different to past betas; there’s no one obvious place to go to level, there’s no central hub city like Shattrath or Dalaran. There are various breadcrumbs from existing Azeroth to the new zones, but – unlike past expansions – there are so many changes, big and small, in old Azeroth that it’s easy to get distracted poking around what’s changed. I’d hoped to provide a fly-through video of the new-and-improved Stormwind, but unfortunately I’m having trouble recording decent quality videos at the moment, so that will have to wait. In the meantime, I’m working on a rundown of the paladin changes in Cataclysm – there are some very interesting design decisions becoming apparent – and I hope to post it ASAP. I was going to title this post “Goodbye, Azeroth”, and then I realised that might sound as though I were leaving. No fear; I’ve been busy lately (although things have improved now), but I’m still here. However, Azeroth won’t be for much longer – at least, not as we know it today. That’s right; in news that came as a complete surprise to absolutely nobody, this week’s BlizzCon has seen the announcement of the third WoW expansion pack, Cataclysm. There’s some huge changes afoot – which are, of course, all over the blogosphere already. A big revamp to Azeroth – many zones will be changed or destroyed, and the political landscape will shift for both factions. Revamped Azeroth will finally allow flying, huzzah! Revamped Azeroth will also include a number of new zones, which will cover levelling to the new level cap – 85. There’s a new profession, Archaeology. It’s a secondary profession like fishing or cooking, so everyone can train it. Two new races: Goblins for the Horde, Worgen for the Alliance. New class options for existing races! …oh man, I can’t keep up. Seriously, there’s a lot of information coming out of BlizzCon; I recommend watching MMO-Champion and World of Raids for all the news. Human hunters, gnome priests, orc mages – lots of changes here. This handy image from MMO-Champion sums it all up nicely. The big one for us, of course, is: tauren paladins! Welcome aboard, beefy brethren! Instead, uncrittability will be handled by talents (as it is now for druids), and stats like Spellpower and Attack Power will now derive directly from Intellect and Strength respectively. (Hunters, Rogues and Shammies will get their AP from Agi.) Mana regen will be handled by Spirit, and all healers will get a regen-mana-in-combat ability a la Meditation. Still, if you think this is a big change, think how hunters feel – they’re getting turned into a mana-free class! I’m optimistic at this point, but cautiously so. The world changes and storyline progression both look awesome, and I’m getting that rush of “omg must see it must play it must test it whee!” that I always get when an expack is announced. I’m more cautious about the mechanics changes – the higher degree of homogenization in gearing is a bit disappointing – but I’m certainly prepared to Wait And See ™. One of These Things Is Not Like The Others! Blizzard typically designs its raid zones in three different sizes: you’ve got the one- or two-boss zones, the half-a-dozen boss zones, and the raids with a dozen or so bosses – give or take. …once we say “tanking niches” players have visions of the DK who parks outside of Icecrown until boss 4, 17 and 31 (yes, IC is that big). At the risk of sounding like a lolcat, ZOMG. No wonder they introduced raid timer extensions! an example on how we don’t want raids to rotate in tanks, I wanted to pick what I hoped was a ridiculous number so that players wouldn’t try and and deduce from my answer how many bosses Icecrown has. With my “Tourist Guide” series I attempted to present a comprehensive guide to the Argent Tournament and their goings-on in Northrend, so let’s look at the new content coming in Patch 3.2. This post is Part IV in the series, a guide to all the new content introduced in Patch 3.2. This includes a new quest hub, new rewards, and changes to existing quests. Part I: explains the scenario and the location, the side quests and the Aspirant stage of mounted combat. Part II: covers the Valiant stage of the mounted combat event and questing. Part III: covers the Champion stage of the questing, and where to go from there. Part IV – The Argent Tournament in Patch 3.2: covers changes to the Argent Tournament, and delicious new content and rewards. Silver Covenant/Sunreavers: Shimmering Wyrmling – this is BoE, but requires Exalted with the Silver Covenant or Sunreavers to use. 40 Champion’s Seals. Argent Crusade: Argent Pony Bridle – BoP, 150 Champion’s Seals. This upgrades the Argent Squire or Argent Gruntling you receive in the first stages of becoming a Champion; once you’ve done this upgrade, your Argent minion can give you access to your mail, your bank or a vendor, once every eight hours. Argent Crusade: Argent Warhorse, Argent Charger (the latter is paladin-only). These both require the Crusader title. 1 new banner for the Argent Crusade, costing 15 Seals. A Silver Confidant, for the Alliance, requires you to have reached Exalted with the Silver Covenant and Champion status with at least one city. The Sunreavers is the Horde equivalent, requiring you to reach Exalted with the Sunreavers and Champion status with at least one city. The new quests generally focus around two plot points in 3.2: either keeping the tournament competitors happy (and, usually, well-fed), or helping save the Tuskarr of Hrothgar’s Landing (an island to the north of the grounds) from the aggressive invading Kvaldir. The following new dailies can be found in your faction’s tent. They both require Exalted with Sunreavers/Silver Covenant, and reward one Champion’s Seal each. One NPC from your faction will give a random daily selected from the following: killing kvaldir, performing last rites for the tuskarr, retrieving stolen supplies from the kvaldir, simply killing the kvaldir, or rescuing Crusaders from the Scourge. The other NPC from your faction will give a random daily selected from quests to collect shark meat, collect jormungar eggs, or finding snobolds for a magnataur. The following new dailies require you to be a Crusader, and are given by new NPCs in the Argent Crusade tent near Crusader Rhydalla. They give one Champion’s Seal each unless otherwise stated. High Crusader Adelard gives one daily from a random selection to kill various Kvaldir NPCs: Ornolf, Kharos, Yngvar, or Drottin. Crusader Silverdawn gives one daily from a random selection including gathering soul crystals north of Corp’rethar, killing kvaldir and attacking a North Sea Kraken (which looks like Tethyr or Lurker Below), and possibly other quests. There are a number of changes to existing quests. As a general rule, the dailies will now send you further afield, and you will no longer be able to “double up” and complete the Valiant and Champion versions of a daily by killing a single set of mobs. A Valiant’s Field Training used to require you to kill 10 Scourge in Icecrown. Now it specifies 10 Converted Heroes, north of Corp’rethar. Taking Battle to the Enemy used to require you to kill 15 Scourge in Icecrown. Now it specifies 15 Cult of the Damned members anywhere in Icecrown. Battle Before the Citadel used to require you to kill 1 Boneguard Commander, 3 Boneguard Lieutenants, and 10 Boneguard Scouts (which overlapped nicely with the Valiant version of the quest, At the Enemy’s Gates). This now requires you to kill 3 Boneguard Commanders; the Valiant quest remains unchanged. Remember – more details to follow, as soon as the PTR is accessible again! 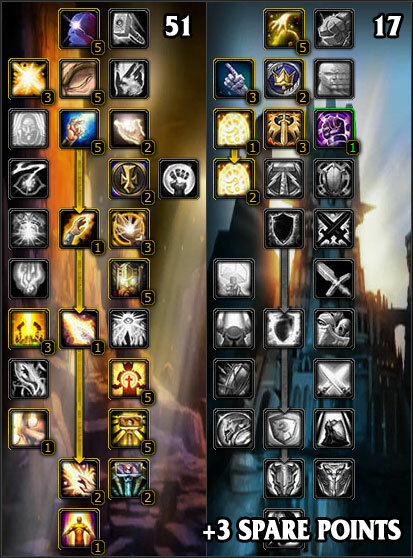 The classic Holy/Ret build synergises excellently with the current strength of Crit Rating as a holy paladin stat, but there’s a new contender on the scene: the 51/17/+3 Shield spec. Divine Sacrifice redirects 30% of all damage taken by raid members within 30 yards to you, for 10 seconds. Like Hand of Sacrifice, it’s capped at 150% of your health – but if you have Divine Shield up, that cap doesn’t trigger and it’ll mitigate the full 30% for 10 seconds. This is invaluable in situations where you’ve got big incoming damage on more than one target, or significant raid-wide damage (such as XT-002’s Tantrum, or Hodir’s Frozen Blows). Edit: As a commenter pointed out, there are some indications that this will be “fixed” in 3.2 so that Bubble or No Bubble, it still caps at 150%. That definitely reduces the utility of the cooldown, although it doesn’t affect Divine Guardian. Divine Guardian increases your Divine Sacrifice to 40%, which is a nice bonus, and it doubles the duration of your Sacred Shield and increases the amount your SS absorbs by 20%. That’s a hell of a lot of punch from two talent points. This build really comes into its own when you’ve got 4 pieces of Tier 8 armor, for the set bonus: “Your Sacred Shield can now trigger its effect every 4 sec instead of every 6“. Effectively, this set bonus provides up to an extra 50% mitigation by letting Sacred Shield proc more often; when combined with the increase in absorption from Divine Guardian, your Sacred Shield can become a very powerful protective tool. I know it’s hard to put aside the Crit Rating for something as unglamorous as a better shield, but I think every holy pally should at least take a look at this build when patch 3.2 hits, if they haven’t already. Blizzard have been unhappy about the state of holy paladins for a while now – apparently crit is “too strong” a stat for us, and they don’t like our distaste for mp5 – and as has been widely reported, 3.2 brings some pretty solid regen nerfs to the table for us. In return, they’re buffing the mp5 on most items, in an attempt to make it more appealing for us. Spell crits will restore 30% of the spell’s base mana cost, down from 60%. Replenishment will restore 1% of maximum mana per 5 seconds, down from 1.25%. Divine Intellect will give 10% extra Intellect, down from 15%. So, we loseWeight Exercise 5% of our intellect, plus Replenishment’s been cut by 20%, plus crit-based mana regen has been halved. In exchange, we get a more powerful Beacon of Light (which is a subject for another post), and 25% more mp5. If you want to know just how this is going to affect you, you need to take a look at overall data from a raid, rather than just relying on your perceptions. I’ll use WoWWebStats (WWS) parses here to demonstrate, but you can also use other sites like WoWMeterOnline (WMO) or World of Logs (WOL). Before a raid, take note of how much holy crit rating you have – personally, I’m usually around the 41-42% mark when buffed (since I don’t usually get Focus Magic, and we don’t have a regular raiding boomkin). 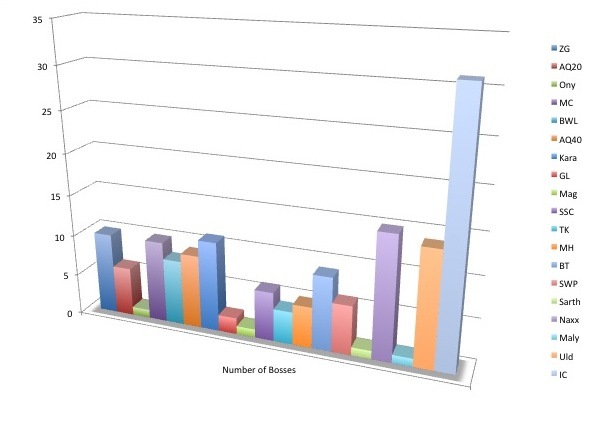 Because we’re losing 1/3 of the boost of Divine Intellect, it’s important to note how that affects our other stats. To calculate this, make note of your stats when raid-buffed, then divide your current Intellect by 1.15 and multiply the result by 1.10, to see your raid-buffed Intellect after patch 3.2. In my case, I’ll be going from 1657 Intellect to 1584 Intellect, a drop of 73 Int. Losing 73 Int costs me 1095 Mana and about 0.438% Spell Crit, which will further reduce the effects of Replenishment and Illumination. Reducing mana pool will also affect the mana return from Divine Plea, but that’s a factor that’s under your control, as you can adjust how frequently you use Plea to compensate for a reduced return. After the raid, take a look at the WWS parse. (If your raid group doesn’t use WWS or an equivalent service, you can save your own combat logs and upload them for your own use.) Select yourself, and pick a boss fight you think was typical, or pick “all bosses” or “defeated bosses” from the split menu if you want an average for the whole night. Now, look at the top section of stats, and look for your “HPS time” stat. That’s the amount of time WWS identifies you as healing. This sample just shows one fight, so the HPS time is 6:17. If it’s a full night, the HPS time will be far higher, of course (but lower than you’d expect, since every raid wastes a surprising amount of time on getting ready, recovering from wipes, clearing trash, strategising, and so on). So, now you’ve got the time you spent healing, the next step is to find out how much mana you got back from critical heals during this time. For this, click on the “Energies & Dispells” tab below the first block of stats, and look for Illumination (which is the talent that restores mana after crit heals). From these two screenshots, you can see that I spent six minutes and seventeen seconds healing (or 377 seconds), and got 27,718 mana back from crit heals. This equates to approximately 73.5 mana per second, or 367.6 mp5. Obviously, these numbers are going to vary based on factors like the rest of your healing team, whether it’s a progression fight or farm content, your latency, and so on. So, my 41% spell crit gave me back mana equivalent to 367.6 mp5 on that fight. Halve that. That’s how much mana regen you’ll loseWeight Exercise from crits when patch 3.2 hits. Also note that your reduced Intellect (as calculated in Step 1 above) will also reduce your spell crit, reducing Illumination-based mana returns further. On WWS Replenishment will show up in the “Energies and Dispells” display, just like Illumination. It doesn’t show on the screenshot above, because that fight had no-one with Replenishment, so here’s a sample screenshot (from a fight with 5:46 HPS time). On this fight, Replenishment restored 8190 mana over 346 seconds, an equivalent of about 118.3 mp5. Take the Replenishment value, and multiply it by 0.8. This new value accounts for the nerf to Replenishment itself. Now take this new value, and multiply it by 0.956, which accounts for the nerf to Divine Intellect (since 0.956 is 1.15/1.10). That’s the new amount of mana you’d have regained from Replenishment in an otherwise identical situation, post-3.2. Using the screenshot as an example, we get 8190 * 0.8 * 0.956 = 6263 mana over 346 seconds, or about 90.5 mp5. That’s a loss of nearly 28 mp5, on this particular fight. Obviously, that’s a very small sample; for accuracy, you’re best off looking at a number of raids and totalling all the Replenishment mana returns and HPS times before you do any calculations. This one’s the most straightforward calculation. On your character sheet, take a look at your current mana regeneration while casting (without Blessing of Wisdom), and multiply that by 1.25. That’s your new gear-based mp5 total. Using the above calculations, you can work out how much mp5 you’ll loseWeight Exercise from the nerfs to Intellect, Illumination and Replenishment, and how much you’ll gain from the buff to mp5 on gear and enchants. If you’re still primarily in Naxx gear, you’ll likely loseWeight Exercise a fair bit of mana regen overall, because there was plenty of Naxx gear with Haste & Crit, and no mp5. If you’ve moved into Ulduar gear, the impact will be lower as pretty much every single piece of Ulduar spellpower plate has mp5 on it. However, there’s one important factor to bear in mind: mana regen from mp5 is not the same as mana regen from crit. Quantitatively, they might still give you back the same amount of mana; qualitatively; they’re different. Mana regen from spell crits lends itself to spike-based healing; crit-focused healers are good at throwing out a lot of healing very fast to compensate for damage spikes, and Illumination restores mana dynamically; the more you use, the more you regen. Mp5-based mana regen, on the other hand, is a steady trickle of mana; if you engage in over-enthusiastic spike healing, you may run yourself excessively mana-dry until you wait for the pool to slowly top itself back up again. mp5-based mana regen lends itself to more measured, steady healing to keep a target topped up, and is particularly aided by mitigation from shields and damage diversion abilities (like HoSac and Divine Sac). Whether we like it or not, Blizz has decreed that we need to focus more on mp5 and less on crit. Numbercrunching will help us mitigate the impact of the changes – by being ready to use more mp5-based gear, for instance – but it’s also going to be important to keep playstyle changes in mind, too. Look, it’s a post! Yes, I know it’s not a pally post, but the 3.2-related stuff is still brewing. 4 July 09: Unfortunately this post has lost all its comments due to technical reasons. Patch 3.2 brings with it WotLK’s long-awaited epic gems. The item names have been known ever since they were datamined during the beta, but they’ve never been available until now. There are six new gems, of epic quality. As far as I can tell, based on datamined info from MMO-champion’s internal DB, every uncommon/rare cut in WotLK has an epic equivalent except the prismatic “Enchanted” gems (the ‘all stats’ pearls). Edit: as of PTR build 10072, there’s now an “all stats” epic gem – the Nightmare Tear, +10 to all stats, unique-equipped, matches any socket, and requires a Dragon’s Eye and 5 Infinite Dust to cut. The values on the gems are increased by 25-33% over the rare cuts, except with mp5 (which is in line with the boost to mp5 on gear in 3.2). So a +16 attribute rare cut will be a +20 attribute cut in its epic versions. I’ve revised the Jewelcrafting Quick Reference Sheet: WotLK Edition to include all of these cuts. 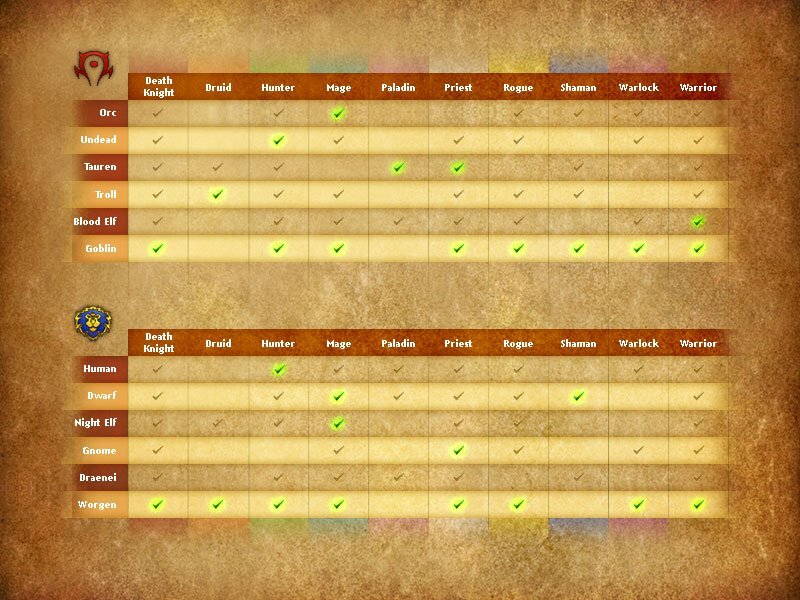 This table includes all jewelcrafting gem cuts excluding BoP gems that are JC-only. It is current as of 25 June 09. If you prefer it in PDF form, you can download a copy here: jc32a.pdf. Last updated 25 June 09. The ‘prismatic’ quality of jewelcrafter-only gems is being removed – the Dragon’s Eye JC-only cuts will now have a specific color. Bold Dragon’s Eyes will be red, Brilliant Dragon’s Eyes will be yellow, and so on. This will make it harder to meet socket bonuses and meta gem requirements for unpopular gem colors (*cough*blue*cough*), and many people had expressed a hope that Blizzard would add orange, purple and green JC-only gems. Alas: such things are, so far, absent. Where Do the Cuts Come From? As you can see in the images linked above, there are 72 cuts for epic gems. The patterns are BoP and require 450 Jewelcrafting to learn. They can be purchased from the Dalaran Jewelcrafting trainer, Timothy Jones, for 5 Dalaran Jewelcrafting Tokens each – so you’ll need a whopping 360 tokens to buy ’em all. Edit: As of 3.2 going live, the patterns cost 4 tokens each, requiring 288 tokens in total. Where Do the Gems Come From? 8 Titanium Powder (which can currently be used for a quest handin on the PTR; according to commenters Catreina and Megree, this rewards 1 Dalaran JC token per 10 powder). Obviously, this isn’t a big enough sample to get a realistic idea of drop rates; this could have been a very unlucky (or lucky) batch. Edit: I just did another batch of prospecting (9th July, PTR build 10072) and 350 ore netted me 18 epic gems, 8 blue gems, 99 green gems and 62 titanium powder. This looks like about a 1-in-4 ratio for getting epic gems out of a prospect, which is pretty expensive given the scarcity of titanium; that will likely keep epic gem prices high. You can transmute all six colors of gem. The transmutes for five of the gems are taught by the Dalaran Alchemy trainer, while the Cardinal Ruby transmute is taught by a quest from the same NPC. It’s a simple quest, requiring you to complete 5 epic gem transmutes of any other color. Edit: the transmute mats have changed; thanks to Simes for alerting me. You can buy all six colors of epic gem from the Jewelcrafting Quartermaster in the PvP vendor centres in Stormwind and Orgrimmar. They’re currently set at 10,000 honor, which is the same price as rare gems on live servers, so I suspect that price may increase. Patch 3.1 brought the Argent Tournament, a new world event featuring mounted combat, new daily quests, new mounts, pets, tabards, and new and interesting ways to get reputation. Read on for a guide to the Argent Tournament! Note that this is a couple of months late, by now! However, I know there are some folks out there who still haven’t started the Argent Tournament and have found the previous parts of my guide handy, plus I’m about to write the fourth part with a guide to the changes in Patch 3.2. So! You’ve acquired your 25 Valiant’s Seals and you’re keen to qualify as a Champion of your faction? Read on! Hand those 15 seals in to your faction’s Grand Champion, who will give you a new quest, The Valiant’s Challenge. This quest asks you to equip your lance, mount up and ride to the Argent Valiant’s Ring (location A on the map below). When you’re there, speak to Squire Danny; he summons a Champion for you to fight. Once you’ve beaten the Argent Champion, return to your faction’s pavilion and hand in. Congratulations, you’re now a Champion! If you have Exalted reputation with your home city, you’ll also get the “Exalted Champion of…” achievement at the same time, and a shiny new title. Now that you’re a champion, you’ve got two paths to follow: doing the Champion-only dailies, and beginning to Champion another city. In your faction’s tent, the other racial faction leaders will have quests; pick the next faction you wish to champion, and accept their quest. That will make you a valiant of that faction, as well as a champion of your first faction – for instance, if my home faction is Stormwind and I go to the Ironforge leader next, I’ll have access to all the Champion dailies, and the Stormwind vendor, and I’ll also be considered an Ironforge valiant and have access to their dailies. Taking Battle to the Enemy requires you to kill 15 Scourge in Icecrown, and can be done at the same time as the Valiant daily A Valiant’s Field Training for doubled-up quest credit. Battle Before the Citadel is a mounted quest at Corp’rethar, and can be done at the same time as the Valiant daily At the Enemy’s Gates for doubled-up quest credit. Threat From Above is a group quest to kill a frost wyrm near Aldur’thar; you can only get this quest after completing Crusader Rhydalla’s questline about the Black Knight. Among the Champions is the Champion-level jousting quest. Squire Artie in the Argent Pavilion also gives a daily quest to donate 10 gold in exchange for 100 Argent Crusade reputation; obviously this isn’t available to people with Exalted reputation. Champion dailies pay gold, plus Champion’s Seals (the currency for Argent Tournament rewards), plus a choice of either a Writ or a Purse. The Writs can be turned in at the factional vendors for tokens that increase your racial city reputations; the Purses contain 10g and very occasionally an extra Champion’s Seal. This is a fairly straightforward group quest to kill the frostwyrm Chillmaw, who spawns around 43,32 in Icecrown. Throughout the fight Chillmaw spawns three Cultist Bombadiers, who are also required for quest completion. This quest can be soloed by some classes, particularly those with self-healing abilities and/or pet tanks. However, on reasonably populous servers there’s a constant stream of “LFG TFA!” in Icecrown General chat, so there’s no reason to go it alone unless you’re trying to prove something to yourself. The ickiest bit of the fight, other than competing with other groups to nab the spawn (which is mostly handled fairly courteously on my server, but not always), is in handling the bombadiers who spawn. They throw bombs on the ground which explode on a time delay, so if you stand in the one spot for too long and don’t watch your surrounds, you easily can be killed by a couple of explosions. This is the Champion-level jousting quest; look for the Ring of Champions at point E on the map above. The Trial to become a champion is a good indication of the increased difficulty of the NPC champions, compared with the NPC valiants. They’re tuned more finely; they put shields up faster, they’re more aggressive, and they’re harder to shake to get Charge distance on. However, they’re still eminently beatable; if you have problems, just stick to the strategy I described in Part II of this guide series for the valiants, and you’ll come out on top (albeit slowly). Once you’re a Champion of one or more factions, you can buy rewards with the Champions Seals you receive from the daily quests (which, unlike the Aspirant and Valiant tokens, can be found on your Currency pane rather than in your bags). The Horde equivalents are the Sen’jin Fetish, Tirisfal Batling, Enchanted Broom, Durotar Scorpion and Mulgore Hatchling. 5 tabards, one per faction. 50 Seals each. The Horde equivalents are the Swift Purple Raptor/Darkspear Raptor, White Skeletal Warhorse/Forsaken Warhorse, Swift Red Hawkstrider/Silvermoon Hawkstrider, Swift Burgundy Wolf/Orgrimmar Wolf and Great Golden Kodo/Thunder Bluff Kodo. 1 flying mount, available to Alliance and Horde: the Argent Hippogryph, for 150 Seals. 5 banners, one per faction. 15 Seals each. Banners have no purpose other than to be placeable decorative items. Hey folks, sorry it’s been so quiet around here lately — between family health woes and recovering from being sick myself, I haven’t had two brain cells to rub together! Things should be back to normal now, though. There are plenty of guides around – my own, and other people’s – that tell you what gear goals you should set, how you should gem, what consumables you should use. The big problem with most of these guides is that they don’t tell you why. They don’t make the relationships between healer stats clear, so people wind up following a set of rules they don’t understand. If comments on my posts are anything to go by, there are a lot of other-spec paladins learning the ins and outs of Holy, trying to make sense of all the advice. Knowledge is power, so let’s take a step back and look at first principles: your attributes. This is your single most important stat, in the sense that if you don’t have enough of it, all the other stats in the world won’t help. There’s no point having a mana pool that will last for ten minutes of chain-casting if your heals aren’t big enough to keep your tank up. What this means is if you have 1500 Spellpower, your Holy Lights will heal for an extra 2490 (1500 * 1.66), your Flashes of Light will heal for an extra 1500, and so on. Intellect is the new black, as far as holy paladins are concerned. I’ve written about this before in detail, but to reiterate: all the important sources of mana regeneration are either based directly off the size of your mana pool (Divine Plea, Replenishment, Mana Tide Totem) or are affected by the amount of Intellect you have (Illumination-based mana return from heals that crit). Great synergy; there’s nothing about Intellect that’s useless, and that’s why you’ll see holy paladins running around with a 30K mana pool in raids. It increases your throughput; a crit heal does 50% more healing than a non-crit. It returns 60% of the mana cost of the spell, from the Illumination Holy talent. Obviously, crit is very popular with most paladins; including talents, you can get over 40% unbuffed Holy crit chance in Naxx-25 gear. At level 80, 45.9 Crit Rating gives you 1% chance to crit. Haste is something of the ‘new kid on the block’; it’s something that most paladins haven’t seen on their gear before (unless they were raiding Black Temple and Sunwell Plateau). It decreases the time required to cast a spell, but the way the mechanics work make a lot of people go crosseyed. I read a fantastic guide to spell haste the other day, but stupidly I forgot to bookmark it, so I can’t link you all to it. So, I shall roll up my sleeves and attempt to explain it myself. The way to make sense of Haste is in terms of how many spells it will allow you to cast in a given time period. 10% spell haste doesn’t knock 10% off the cast time of a spell, it means that in a given amount of time you can cast 10% more spells. In fifteen seconds, you could normally cast 10 Flashes of Light. 10% spell haste makes each FoL faster, so that you can fit 11 of them into those fifteen seconds. So the base cast time of Flash of Light is 1.5 seconds; if you have 10% Haste, it reduces the cast time to (1.5 / 1.1), or 1.36 seconds. If you have 20% Haste, FoL’s cast time is (1.5 / 1.2), or 1.25 seconds. And so on. It reduces the Global Cooldown as well, down to a minimum of 1 second. As your Haste rating increases, more Haste has less effect on the cast time of any one spell, but it still increases how many spells you can cast over a given time by the same amount. Haste is multiplicative, so if you have 10% haste from gear and another 5% from buffs, you actually have 15.5% Haste, not 15%. If you incorporate all the haste effects you might get in a raid (Wrath of Air Totem, a Ret paladin’s Retribution Aura, your own Judgements of the Pure talent, et cetera) 20.6% Haste from gear and consumables will get you to the ‘cap’ of 1.0 second Flashes of Light (and a 1.0 second GCD). At level 80, 1% spell haste requires approximately 32.79 Haste Rating. Bear in mind that haste has two effects on your healing: a) it increases your overall throughput, by allowing you to cast more spells in the same amount of time, and b) it increases your responsiveness by reducing your cast time, allowing you to get that emergency lifesaving heal off that much faster. As your Haste increases, the effect of more haste on the latter decreases – it still reduces your cast time, just not by as much. mp5 used to be beloved of holy paladins, back when we were all Flash of Light spammers. Because Flash of Light is much more mana-efficient than Holy Light, crit-based mana return didn’t matter as much, whereas well-stacked mp5 let you cast Flash of Light til the cows came home. That’s changed in WotLK however; for starters, we need to use Holy Light heavily to keep up with incoming damage, and the mp5 needed to keep up with that would be prohibitively high. Secondly, gearing for Int gives better mana regen and throughput than gearing for mp5. mp5 is not a bad stat, and there’s no need to ignore an item just because it has mp5. However, taking mp5 at the expense of superior mana return stats – that is, Intellect and Crit – is generally a mistake. There are a couple of limited situations where mp5 may beat Int and Crit: if you’re silenced a lot, and can’t cast (to cast Divine Plea or regen mana from spell crits), if you have to move a lot, or if you never have a Replenishment buffer in the raid, no access Mana Tide Totem, and are bearing a lot of the healing load so you can’t afford to Divine Plea often. So, What Do You Pick? 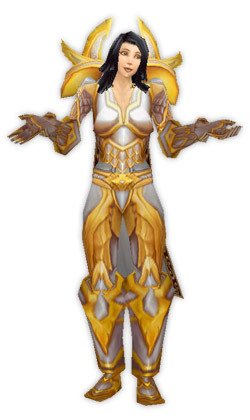 Most paladin guides you read say “stack Intellect!” with no exceptions or explanations. However, I tend to believe that that’s overly simplistic and not terribly helpful advice without context – these are generally guides aimed at raiding paladins, and stat advice for a geared healer in a 25-man raid group is quite different from guidelines appropriate for a starting healer in 5-mans. As a fresh 80, in 5-mans and heroics, people aren’t going to die because you ran out of mana after a ten-minute fight; if the fight’s long enough for you to OOM, your DPSers are probably underperforming. No, in my experience, people generally died in 5-mans and heroics because I couldn’t keep up with incoming damage, or I couldn’t get a heal onto them fast enough after a spike. As such, you should be gearing for spellpower first; extra mana’s no good if your heals aren’t big or fast enough to keep the tank up. So focus on spellpower until you have a reasonable level of it – as a rule of thumb, I’d say you should stack spellpower until 1650 or so. (Within reason, of course; don’t equip green “of spellpower” gear that has no other stats on it.) You’ll get Crit and Haste as part of this process, as just about every piece of appropriate gear has one or the other on it – sometimes, if you’re lucky, both. Once you have a reasonable level of spellpower, start diversifying. Make sure your crit and haste levels are up to scratch – 30% holy crit, unbuffed, is a reasonable target for crit, and somewhere around 250 haste rating (8% Haste). This is the point at which you can start stacking Intellect in your gem and enchant selection. TL/DR! What’s the bottom line? You need to gear for spellpower first, to make sure you can keep up with incoming damage, before you start stacking Intellect like all the other guides say. Credits: This FAQ was developed in response to a request from Josh of Eye For An Eye, and was created at the PlusHeal forums with input from the community there. I’m posting a modified version of it here as a number of readers don’t frequent PlusHeal (although you should! it’s great!). The format is based on Josh’s excellent Ret 3.0 FAQ. Current as of 27 Mar, WotLK 3.0.9 build 9551. This FAQ includes details that will be not be relevant after 3.1 goes live. It will be updated ASAP. Many answers are simplistic and don’t go into details about choices in gearing, consumables, et cetera. This is intended to be an all-in-one FAQ; detailed discussions are elsewhere. 0. What do I do? More than any other healer, paladin healers have a clearly defined role: you excel at healing a single target (or two) for massive amounts. You have no Heal-over-Time spells and no AoE heals, but you can keep a tank up through tremendous spike damage. Which is not to say you can never heal a 5-man, or raid heal successfully – you certainly can, but it’s not your speciality. 1. How should I spec? For PvE: 51/0/20 or, if you can’t rely on having Kings from another paladin, 51/5/15. Some paladins choose to take the two points out of Pursuit of Justice, and put them into the Holy tree, into Conc Aura and/or Aura Mastery for a 53/0/18 build. For PvP: 51/20/0 is the most common build for pure healing and support, although there are popular Holy/Ret hybrids for PvP as well. 2. What Seal should I use? Use Seal of Wisdom or Seal of Light, depending on which one you have Glyphed (see Q. 7 below). This is purely to activate your glyph, as you’ll rarely be swinging in melee. 3. What spells should I use? There are no hard-and-fast rules about what spells to use in what order, as healing is fundamentally a reactive activity and your choice of spells should always be based on the situation. Flash of Light is a low-throughput spell with very good mana efficiency. Use this for non-urgent raid heals, and topping off the tank if they’re not taking much damage. Holy Light is a high-throughput spell and is often used as the core heal for tank healing. Holy Shock is a talent-based spell; it heals for a little more than Flash of Light, but is instant (with a 6s CD). Use this for an urgent heal. A crit Holy Shock gives you the Infusion of Light buff, making your next Flash of Light instant or your next Holy Light very fast and is a good way to put out a lot of healing fast. Beacon of Light is excellent in situations where a couple of people are taking heavy damage, and can allow you to toss some raid heals while still healing your tank. Keep it on your tank in 5-mans; in raids put it on your heal target (if you’re going to be doing a lot of raid healing as well) or on someone else taking heavy damage. It’s costly on mana, so don’t cast it if it won’t be any use. Sacred Shield should be used on people who will be taking multiple sources of damage, as it only kicks in after the first damage is taken. It does scale with spellpower, so it can absorb a lot of damage when cast a holy paladin. Try and keep it up at all times on your heal target. 4. What Judgement should I cast? – If you are the only paladin, use whichever your raid needs. If they’re not short of mana, go with Judgement of Light as a default. 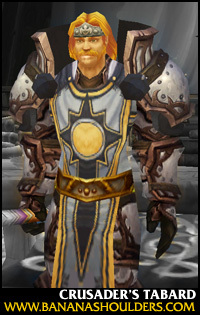 – If there are multiple specs of paladin, have the ret paladins judge Light and the prot paladins judge Wisdom. (If the ret paladins want to judge Wisdom, that’s okay too.) 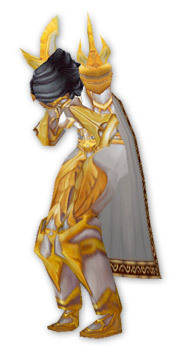 Do not overwrite the prot paladin’s Judgement. For more information on the complexities of who judges what, see this PlusHeal thread, and my previous blog post on the subject. 5. What Blessings do I want? Wisdom > Kings > Sanctuary > Might until you start getting well-geared, then Kings > Wisdom. See this post by Gryphonheart for details. 6. What stats do I want? There is no easy answer to this question. Gearing as a healer is a balancing act between stats that improve your throughput (Spellpower, Haste, Crit, Intellect) and stats that improve your mana longevity (Intellect, Crit, mp5). Intellect is the primary stat for a paladin healer because it affects your mana longevity (via mana pool, mana return effects like Divine Plea, Replenishment and Mana Tide Totem, and increasing your crit chance) and it affects your throughput (via Holy Guidance and increasing your crit chance). However, stacking Intellect early in the gearing process means you’ll never run out of mana, but your heals won’t be big enough to keep your tank alive. Bear in mind that unlike priests or druids, you will rarely get any benefit from Spirit. Don’t throw gear away just because it has Spirit, but ignore it completely when assessing an item’s worth. 7. What glyphs should I use? Minor: none of these are essential; feel free to change them. 8. What enchants should I use? Shoulders: Greater Inscription of the Storm, Exalted with Sons of Hodir, or Master’s Inscription of the Storm if you’re a Scribe. Bracers: Superior Spellpower or Fur Lining – Spellpower if you’re a Leatherworker. Ring: Greater Spellpower if you’re an enchanter. 9. What gems should I use? Follow your order of priorities from Question 6. If you’re still in the stage of gearing up spellpower, use Runed gems in red sockets, and Luminous or Potent gems in yellow sockets. If you’ve hit your target for spellpower, use Luminous gems in red sockets, and Brilliant gems in yellow sockets. For blue sockets, the gems are so weak (relatively speaking) that you should think long and hard about whether you really need that socket bonus; there’s nothing wrong with putting an orange gem in a blue socket if the socket bonus is only 2 mp5. For more details see this post (although bear in mind it’s old and some of the advice could use an update for raiders). 10. Should I stack any melee stats? – Crit and Haste Rating are equally useful for spells. – Stamina is always nice; don’t gear for it, but consider it a bonus. – Hit Rating is useful for making sure you land your Judgement for the haste buff, but shouldn’t be taken over anything more healery. – Strength, Attack Power and Armor Penetration are useless. Defense, Dodge, Parry, Block Rating and Block Value are nearly as useless. When it comes to the ‘perfect storm’ of holy paladin stats – Spellpower, Crit, Haste and Intellect – you’ll often find similar stats on elemental shaman mail, and it can make a good stopgap while looking for plate alternatives. Resto shaman mail is decent too, although it often has mp5 instead of crit, making it much less attractive. 11. Does my weapon matter? Only the caster stats on it. On the rare occasions you melee with it, your ‘white damage’ (the damage caused by the actual DPS of the weapon) is irrelevant. 12. What consumables should I use? Potions: Runic Mana Potion or Potion of Speed depending on your needs. Elixirs: Flask of the Frostwyrm as the baseline flask, or Spellpower Elixir and Elixir of Mighty Thoughts for Elixirs instead of a Flask. See this post for more options and alternatives. 13. What addons should I use? This is very much a matter of personal choice, so I can’t give you a canonical list of ‘the best’. Unit frames: X-Perl, ag_UnitFrames and PitBull are all popular. Plus, of course, any normal addons you might want to use like boss mods, threat meters and so on. 14. What macros should I use? This macro is used where you float your mouse cursor over your raid frames and hit your macro keybind when you’re mousing over the heal target. It’s fast because you don’t have to select a target, and good for healing lots of people at once (eg raid healing) or decursing/cleansing. Replace with the spell of your choice. This macro is designed so that if you have a hostile mob targeted (like a boss), you can cast your heal spell and it will land on the hostile mob’s target. It’s great for healing where you need to save whoever the boss is targeting and change targets fast. – Gives me the glowy-hand spell targeting cursor. Replace with the spell name of your choice. This is used if your healers don’t use addons with rez monitors, to help cut down time wasted by three people rezzing the same corpse. Change the /say to /raid or /# (where # is your healer channel number) if that suits your raid group better. For more useful macros, see PlusHeal: thread 1, thread 2, and the Macros forum.